It's getting chilly around here. So out comes Gammie's family recipe. 1. Brown 1 1/2 lbs. ground beef or turkey. 2. Remove meat and sautee 2 onions in the excess grease from the meat. Combine meat and onions in the Crock pot with 2 cans of whole tomatoes, 1 6oz can of tomato paste, 2 16oz cans kidney beans, 2 bay leaves, 1/2 tsp. ground mustard, 1/8 tsp garlic powder, 1/8 tsp chili powder, 1/2 tsp pepper, 1 tsp vinger, and 1/2 tsp salt. Good for little ones too. 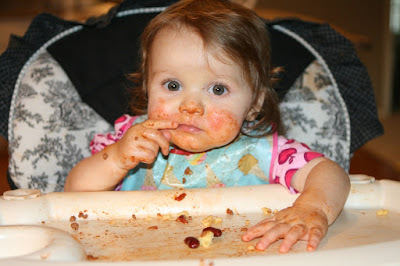 She really liked the beans and meat. 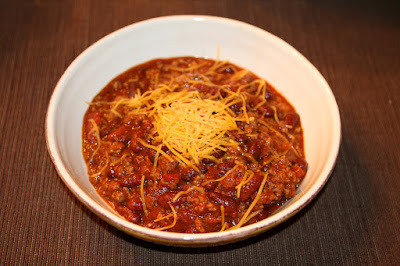 I am posting this recipe at both Tempt my Tummy, Tasty Tuesdays, and Crockpot Wednesdays. Eat Yummy stuff!